Time to Give Out Some Awards! Alisha of Izzy 'n' Emmy has bestowed upon me an award . . . the first for A Blog of Goodies. I am so very honored since this blog is still so young. Thank you Alisha! I humbly accept this award, therefor I must . . .
1. The winner can put the logo on their blog. 5. Leave a message on the blogs of those you’ve nominated. All these blogs have been an inspiration to me in one or more ways. 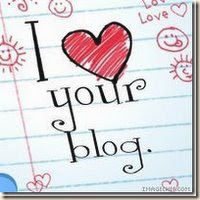 If you've never visited these blogs, bloghop on over there and check them out.